Raise Your Hand Texas is a non-profit educational advocacy group based in Austin, Texas. We worked with RYHT to produce an interactive web map showing the potential changes to school funding under District Partnership Agreements,which enable a school district to be funded similarly to a charter school. This could result in substantially more money for schools, up to $2,300 per student. 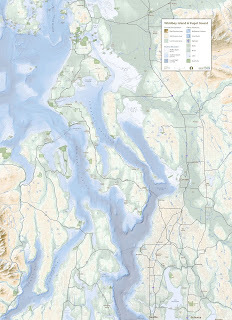 We built this map using a custom Mapbox style and the Mapbox GL JS API. The map features a zoom-to-district functionality (in the fly-out on the left hand side), information about each district will appear in a pop-up when a district is clicked, and zooming into the map will reveal individual campuses. Hovering over the campus location will reveal the name of the school. 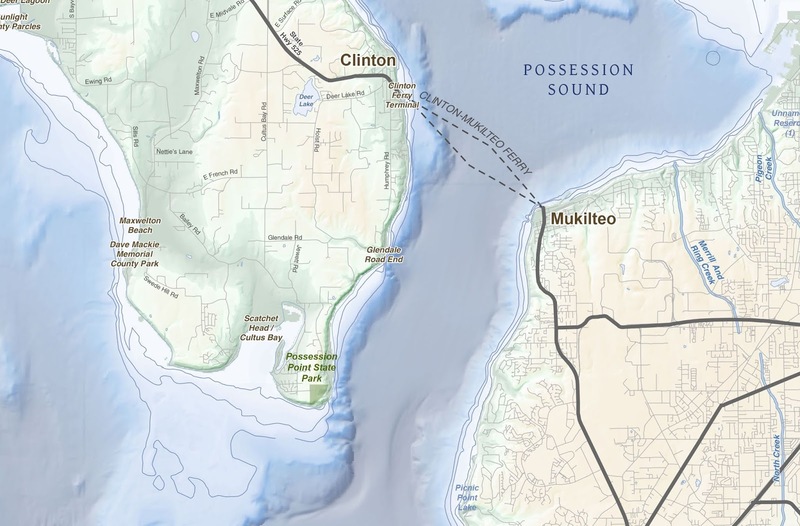 You can view the interactive map here, or click on the screenshot below. In 2015 we worked with The Wilderness Society on their Methow Headwaters campaign, focused on preventing industrial scale mining throughout the Methow Valley of north central Washington. 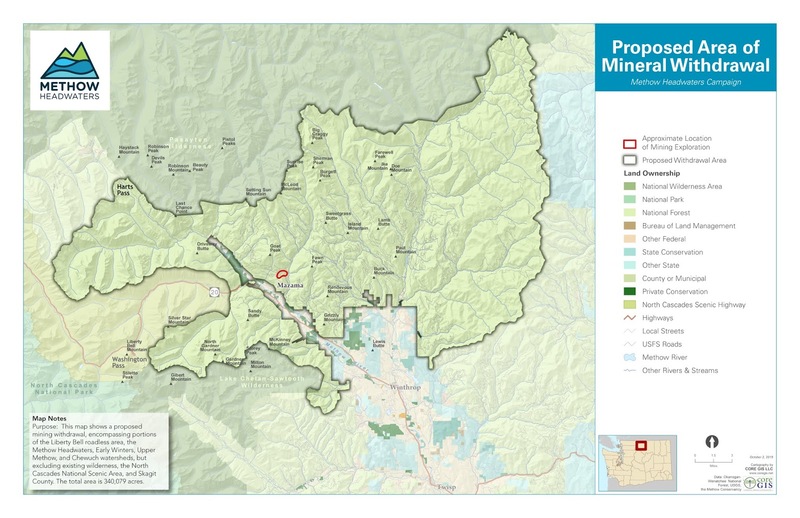 The immediate threat and the impetus for the campaign was a proposed open-pit copper mine on Flagg Mountain that would have had significant ecological impacts on the Methow Valley. 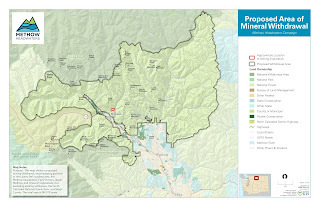 We produced a series of maps, including some oblique three-dimensional views, to convey a sense of the location of the proposed mine, as well as a proposed withdrawal map. 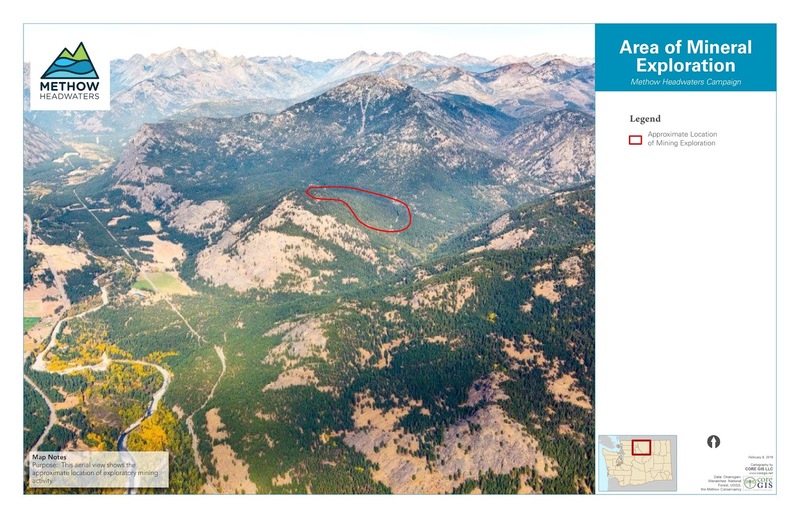 As a result of the Headwaters campaign there is currently a two-year mining ban in place, and the US Forest Service has recommended a twenty year withdrawal to the Bureau of Land Management. 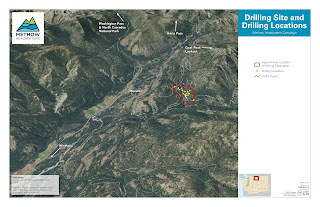 Please consider supporting this withdrawal and the long-term protection of the Methow Valley here. The deadline for comments is Tuesday, November 13th! 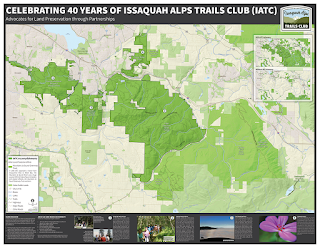 Issaquah Alps Trails Club Accomplishments Map--Celebrating 40 Years of Conservation! 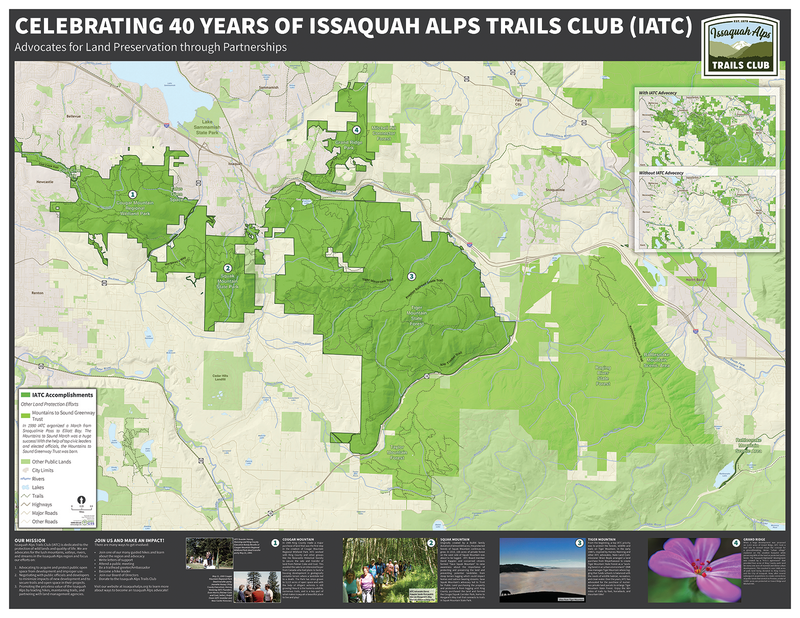 The Issaquah Alps Trails Club has been working to preserve open space and access to trails in the Issaquah Alps region for decades. To mark their 40th anniversary, they commissioned me to create a map showing their accomplishments. 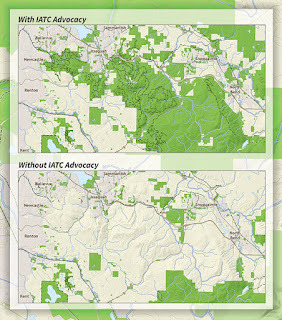 By advocating for open space protections and working with a wide range of conservation partners, the IATC has been instrumental in the creation of beloved and iconic protected lands such as Cougar Mountain Regional Wildland Park, West Tiger Natural Resources Conservation Area, Tiger Mountain State Forest, and many others. Congratulations to the IATC! 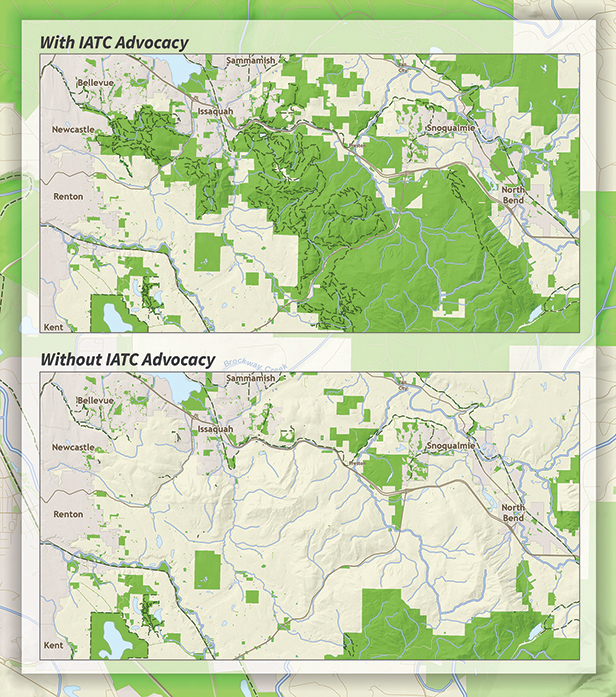 One of my favorite maps is the inset comparing the landscape as it looks today (top) with how it might look if the IATC and their partners had not worked so hard to conserve open space and trails. What a difference! 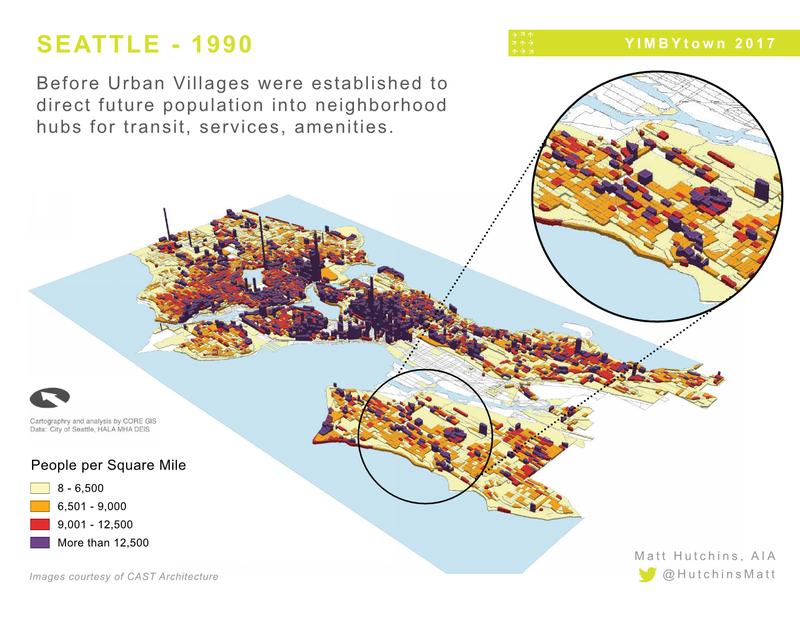 The City of Seattle has grown tremendously over the past thirty years, and has added 114,000 residents just since 2010 (an increase of nearly 20%). This rapid population growth has resulted in a corresponding rapid increase in the cost of housing and the proliferation of construction projects to try to meet the demand. However, as a result of Seattle's zoning policies and Urban Villages strategy, this population growth (and the resulting changes to neighborhoods) has not been evenly distributed throughout the City. We were asked by CAST Architects to model population density within the City of Seattle at three different time periods to get a better handle on where these changes are occurring. We mapped population density at the block level using US Census data for 1990 and 2010 and projected population in 2035 (taken from the City's Housing Affordability and Livability Mandatory Housing Affordability DEIS Alt 1). Block groups are colored by density and displayed in three oblique views with the observer positioned southwest of the city, looking north/northeast. The maps show that the vast majority of the City's population growth has occurred in just a handful of neighborhoods--just 7% of the City's land area has absorbed 77% of all the growth! Matt Hutchins at CAST continues to be a tireless advocate for increasing the construction of Detached Accessory Dwelling Units throughout the City, and used these maps in his presentation to YimbyTown to make the case that Seattle should expand housing options throughout the entire City, not just in the designated Urban Villages. 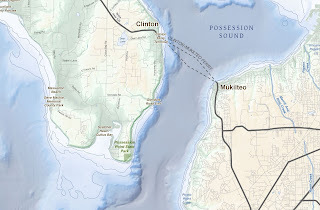 One of my wife's colleagues lives on Whidbey Island. 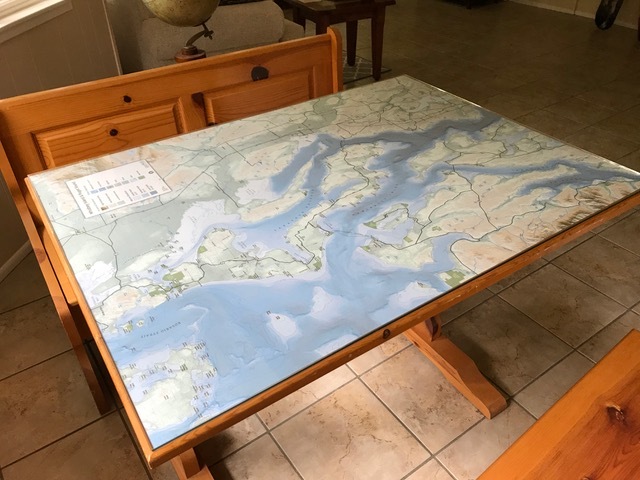 She loves taking visitors on trips around the island, and as a map aficionado, had long dreamed of having a custom map on her dining room table so she and her guests could look at the map before heading out to explore. 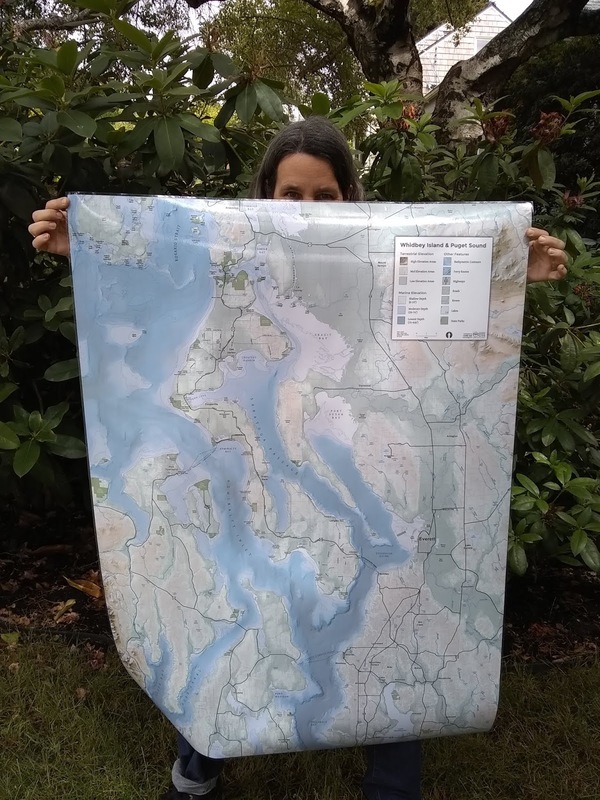 When she learned that I make maps, we had a discussion about what she had in mind, and then she hired me to make a giant map! This was a real treat for me, since the vast majority of the maps I make are digital. 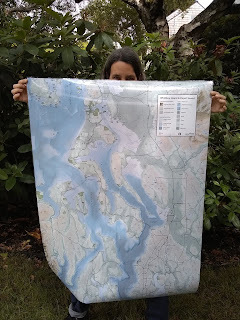 The printed and laminated map. Wife for scale. We had the privilege of working with the I-90 Wildlife Bridges Coalition to produce a series of maps that were featured in the recently released documentary Cascades Crossroads. We collaborated with filmaker Ted Grudowski illustrator/animator Lucy Woodworth. It was a fun project and I think the final product turned out great! Cascade Crossroads from Ted Grudowski on Vimeo. 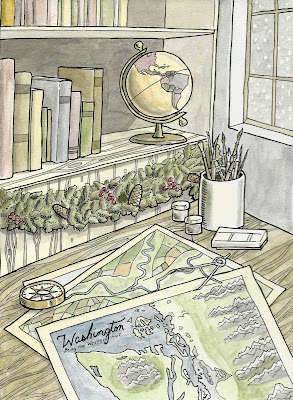 I decided to go the old school route and created this years' holiday card by hand, with pen and ink and watercolor. 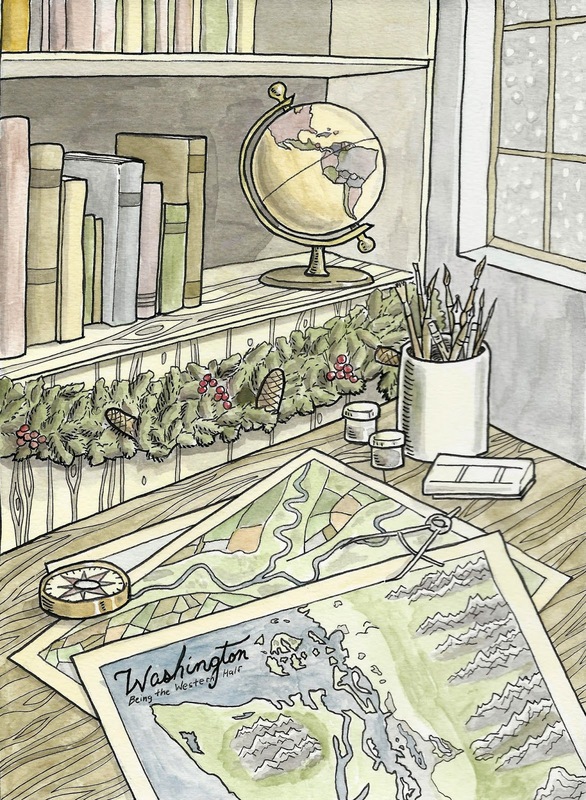 Happy Holidays from CORE GIS!